For centuries, Westminster has been the governmental center of Britain. And within Westminster many historic events occurred and many landmarks can still be found in the area between Trafalgar Square and Parliament Square. In among the government buildings that lie along Whitehall, you can find historic places, museums and famous buildings. Art, architecture, law, the military, human rights, religion, history and of course, politics, are some of the topics that these attractions touch upon. It is not a long walk. 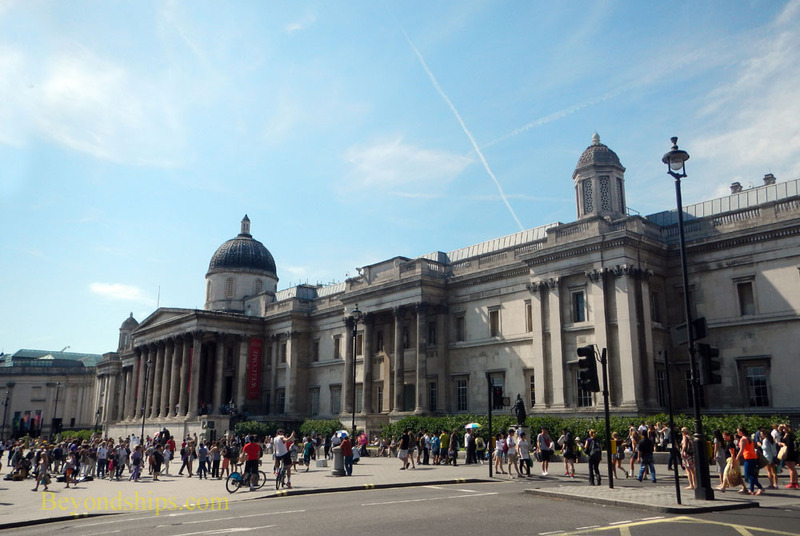 Standing by the entrance to the National Gallery at Trafalgar Square, you can look past Nelson's Column and see the Great Clock Tower at Parliament Square at the end of one of the streets radiating out from Trafalgar Square. With a few diversions, this is the route that we shall follow in this article. Trafalgar Square is often regarded as the heart of London. Centrally-located, it is used for the annual Christmas and New Year celebrations as well as for special events including concerts and victory celebrations. It has seen political demonstrations and been seen in countless movies and television shows. 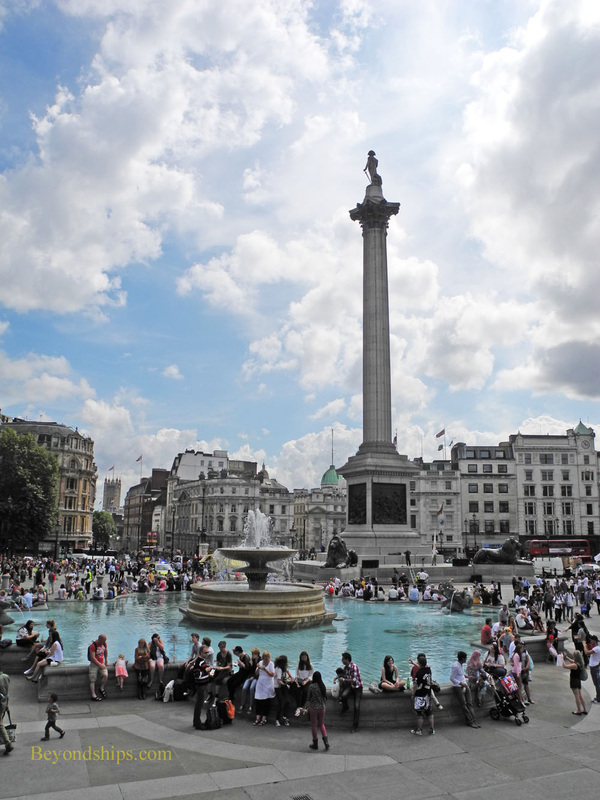 Relative to other London landmarks, Trafalgar Square is of relatively recent origin. For centuries, this area was the King's Mews where the carriages and horses were kept for nearby Whitehall Palace. In 1812, the Prince Regent (later George IV) commissioned architect John Nash to devise a plan to redevelop the Charring Cross area, which encompassed the mews. Nash cleared the area but the redevelopment scheme faltered after his death. The desire to redevelop this area was revived after the completion of the National Gallery in 1838. Sir Charles Barry (best known for designing the Houses of Parliament) developed a plan for a two level square that would include a terrace at the north end by the National Gallery. His plan was approved and the square was opened in 1844. Simultaneously, a campaign was underway to raise a memorial in the square to Britain's greatest naval hero, Admiral Lord Nelson. This resulted in Nelson's Column - - the 170-foot high Corinthian column topped by a statue of Nelson that stands in the middle of the square. The square is named after Nelson's greatest victory, the Battle of Trafalgar. On 21 October 1805, Nelson defeated the combined French and Spanish fleets so decisively that Great Britain dominated the seas for a century following. Other significant features of the square include four bronze lions sculpted by Sir Edwin Landseer, which guard the base of the column and two adjacent fountains. In 1937, these fountains, designed by Sir Edwin Lutyens, replaced two earlier fountains and are dedicated to World War I admirals David Beatty and John Jellicoe. At each corner of the square are plinths. It was originally intended that each would carry a bronze statue. However, the plinth at the northwest corner remained empty for many years. Finally, in 1999, a scheme was adopted to have a series of temporary modern sculptures atop the Fourth Plinth. The great flocks of pigeons, which once dominated Trafalgar Square, have been banished for health reasons. In their place are street performers, vendors and people just taking in the experience. The National Gallery is on the north side of the square. (See separate article). It is one of the world's great collections of fine art and one of London's most popular attractions. To the east of the National Gallery is the Anglican church, St. Martin In The Fields. Designed by James Gibbs in 1721, this church has been the inspiration for many churches around the world. There has been a church on this site at least since 1222. It was literally in the fields between the cities of London and Westminster thus the name. Rebuilt by Henry VIII in 1542, the church was expanded in subsequent reigns. However, by the beginning of the 18th century, the old church was collapsing. Parliament authorized the construction of a new church, which was to be paid for by the parishioners. This resulted in the the neo-classical church we see today. Among the notables buried at St. Martin's are Thomas Chippendale, the furniture maker and Nell Gywnne, popular 17th century actress and mistress of Charles II. St. Martin's remains an active church and has a long history of caring for the homeless. In addition, the church has an award winning cafe in its crypt and hosts a well-known classical concert series including free lunchtime concerts. It also has a brass rubbing center. For more information, see St. Martin's website.